Minced beef, vegetables and onion stew. CLASSIC KITCHEN. Savoury British beef, cooked in a rich gravy with potatoes and peas. 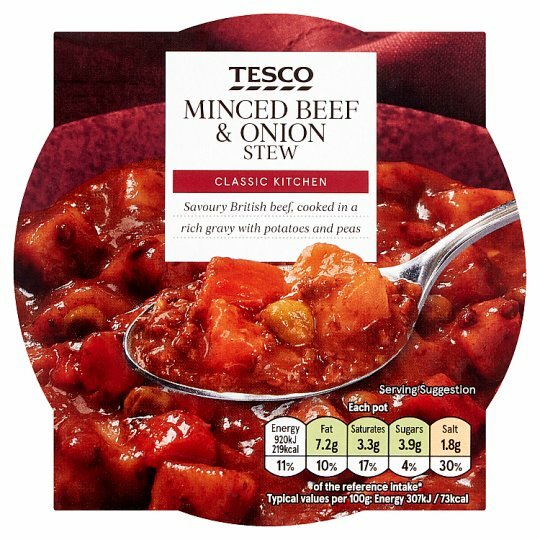 INGREDIENTS: Vegetables (54%), Water, Beef (10%), Tomato Purée, Modified Maize Starch, Beef Stock (Beef Extract, Water, Yeast Extract, Salt, Sugar, Concentrated Lemon Juice, Beef Fat), Maize Starch, Wheat Flour (Wheat Flour, Calcium Carbonate, Iron, Niacin, Thiamin), Salt, Caramelised Sugar Syrup, Black Pepper, Vegetables in Varying Proportions: Potato, Onion, Carrot, Peas. Remove outer sleeve. Pierce film lid several times. Leave to stand for 1 minute after heating. Stir before serving.